Capcom's holiday PlayStation Network sale is in full swing! With Christmas around the corner, Capcom has decided to team with Sony to celebrate by offering discounts on two digital Mega Man titles (among other games). From now through January 10th, you can nab Mega Man: Maverick Hunter X and Mega Man 4 at half-off: Maverick Hunter for $4.99, Mega Man 4 for $2.99. Two great games for under $15, who can resist? Not a bad deal if you’re missing any of these. 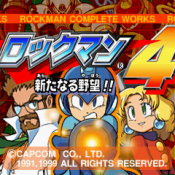 Mind you, Mega Man 4 is Complete Works version of the NES classic, sold in its unadulterated Japanese form. As such, navigating menus can be a little tricky from time to time. Fortunately, that's what this handy guide is for. Use it whenever necessary! If Mega Man isn't your thing (why are you here? ), you'll be happy to know virtually every digital Capcom game is on sale. From Breath of Fire 4 to Street Fighter 3 Online, there's a little something for everyone this season. Head on over to Capcom Unity for the complete list! Update: Prices have yet to be discounted as of this writing. However, the PlayStation Store is currently undergoing maintenance. The issue may be rectified soon. Check back often! Man, I've already got 4. Wish they'd reduce the price on 3, it's the only one available on the PSN that I don't have. As of the time I'm saying this, I see no sale prices, just the normal ones. :( I wonder if this sale is for Playstation Plus members only? Wait, this is the Complete Works version, complete with all of the extras and modes? I might just have to look into this, since we never got a real release of that over here. /SIGH I wish I could get something Mega Man to buy. An HD pack for 9 and 10 would be cool. I can has Mega Man Mania now? As of this writing, the PlayStation Network is undergoing maintenance. They may be getting ready to update the prices, because as some have said, the original prices were still on the store, and not the discounted prices. Bah!!! I have all of these Rockman Conplete Works collection for ps1 and can be emulated from my pc. I´m just waiting for a beter version of the java-based psp emulator to enjoy well Megaman Maverick Hunter X and watch the unlocked videos. @ kotipeltox buy a PSP and get the mega man dual pack for it. trust me, the PSP is worth the price, and there are other good games on it. unless you intend to get the vita, then you can still get MHX via download. it's the only one with unlockable videos. Oh well, if they eventually go down in price as promised, I'll get them. Do these games have trophies? Never has a sentence made my skin crawl so profusely. Then again, both are doing just about everything they can to bring utter ruin to the video game industry so I guess at this point they would make good bedfellows. Well, Maverick Hunter X is on sale, as well as others, like Super Puzzle Fighter II HD. All, except for Mega Man 4, and other PSOne classics. Not only that, but they aren't even among the list of games on sale, now. They still have the original price on the store, but no sale. @EngineR2: I noticed earlier it looks like they edited the list without a word. IMO, they should change the prices, because that's deceptive advertising on their part, to advertise it, and not honor it at all.